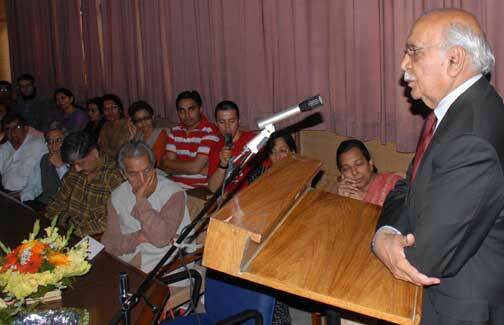 CHANDIGARH, March 13, 2008: The Department of Ancient Indian History, Culture and Archaeology, Panjab University organized Jagannath Memorial Lecture in the Fine Arts Department at P.U. Campus here today. Professor Jagannath Agrawal was a founder faculty member of this department and was associated with Panjab University for five decades. He was a great Ideologist who has contributed immensely in the field of History and Culture of India. Professor R. C. Sobti I Vice-Chancellor, Panjab University released Professor Jagannath Agrawal Centenary Volume Research Bulletin VVRI, No. IV&V. A number of scholars from India and abroad have made contributions as a tribute to Professor Jagannath Agrawal in this volume. In his presidential remarks Professor Sobti expressed appreciation for the works and contributions of Professor Jagannath Agrawal. Professor Ashvini Agrawal Chairman Department of Ancient Indian History, Culture and Archaeology, threw light on the life and works of Professor Jagannath Agrawal. Professor B.N. Goswami (Professor Emeritus, Panjab University) was a chief speaker. He spoke on ‘The Sense of Wonder’. Professor Sobti appreciated him as a researcher and called upon students to work on the historiography of Professor B.N. Goswami. Professor B.N. Goswami gave a lucid talk illustrated with excellent slides which left the audience wonder struck. He referred to ‘wonder’ as an intellectual emotion which is different from ‘surprise’. He showed through his illustrations that painters were influenced and challenged by ancient Indian texts to create visual parallels. On seeing the paintings we notice amazing inventiveness in the painters. The theme of the paintings are mainly from the Bhagavata Purana, Vishnu Purana, Ramayana,Bhagavad Gita and Gita Govinda according to Prof. Ashvini Agrawal, Chairman, Dept. of AIHC & Archaeology, P.U.